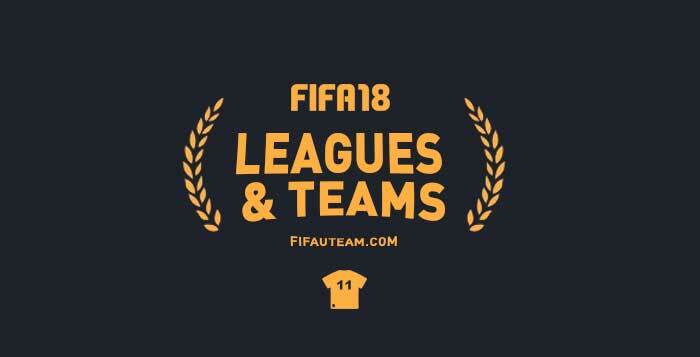 Are you looking to know the FIFA 18 Leagues, Clubs and National Teams that were include into the game? You can find them here. Experience true football authenticity with FIFA 18 – featuring many licensed leagues, clubs, national teams, players and stadiums. Over 30 leagues and more than 700 playable teams from around the world will feature in FIFA 18 on console and PC. Below is the entire list of leagues and teams available to play as or against in FIFA 18. Hi. You would have to ask to EA. They will not add Mamelodi Sundowns to the game in the coming years. Might I recommend a few additional national teams to add to Fifa 19 or even Fifa 20? Thank you and I hope you consider putting these nations into the upcoming games. Thank you for your feedback. You can also vote for your favourites here. They included the Japanese and Korean leagues without their national teams, but India have one. Why? Japan, Korea Republic, China and Iran are all AFC national teams that need to be on FIFA over India. In North America, Costa Rica, Panama and even Trinidad & Tobago deserve a national team on EA FIFA over Canada. ESPECIALLY Costa Rica. They made a deep run in the last FIFA World Cup and is the second strongest CONCACAF national team behind Mexico. What a joke. I loved Costa Rica performance in the last World Cup. They were brilliant. However, EA is a company that is more concerned in maximizing their profit. There are more people from Canada playing FIFA than from Costa Rica. That’s why they added Canada but not Costa Rica. Besides that, national teams licenses don’t have anything to do with leagues licenses. ZELJEZNICAR (Bosnia and Herzegovina) is a team thats loved by its fans and others, fans actually put money together to rebuild the stadium Grbavica that was destroyed by Serbians during the war of 1992-1995, There are lots of famous soccer players today that actually strated the carrer in Zeljeznicar, such as Edin Dzeko (FC Roma), Edin Visca (Bakakeshir) and many more….Also Bosnia national team deserves a place in FIFA 19 because it has some of the best players that are currently playing in the best teams around the world such as: Arsenal, Juventus, Roma, Lazio, Genoa, Hoffenheim, Basaksehir, Middlesbrough, Konyasporm and many more. Slovakia is missing! Please put all Fortuna liga clubs in Fifa 19. Does anyone have a list of which spots in each league qualify for the Champions Cup and which ones for the Euro League? yo you need put CROATIA national team. Tell me how much good players are from Saudi Arabia? Does they have a world class player? NOOOOO!!!!!!! Croatia have:MODRIĆ,RAKITIĆ,MADZUKIC,SUBASIC,LOVREN,KOVACIC… PLEASE PUT CROATIA AND IF YOU PUT CROATIAN LEGUE. THERE IS DINAMO ZAGREB AND HAJDUK SPLIT. THESE TEAMS ARE REALLY GOOD. THANKS FOR READING. Really why the national team of Iran, which is in Asia First, and in the 25th World, with its authority, while second in the second team table, the Korean national team, with 7 points to the 2018 World Cup, should not play FIFA 18, but the national team India, which is the 107th World Ranking and has not seen the World Cup ever, is in FIFA 18? Is Dalkurd FF in the November update Fifa 18? Sorry but that’s new to us. No idea why that’s happening to you. i check the problem. when you play friendly with these teams an form is to in(squads restores) dosn’ t problem. if you have form of there is a problem. but if you change from players chrisman and l.patricio boots problem fix. but in a custom tournoua its necessary to do these changes. Due to fifa rankings, IRAN is the best team of asia for more than two years!!! they were the second team which has qualified for russia world cup, after brasil. they have lots of young talents who is playing in european teams like sardar azmoun in rubin kazan and alireza jahanbakhsh in AZ Alkmaar. they have carlos queiroz as coach of national team, the best and the famous national team coach in asia. they were participated in fifa world cup 2014 and could defend very well against argentina for 90 minutes until they conceded a late goal from the legend: LIONEL MESSI and were beaten 1-0. they will be in russia 2018 again, dreaming to go beyond group stage for the first time in history!!! they were unbeaten in russia fifa world cup qualifications round and even never conceded A GOAL in 9 matches in a group that south korea, uzbekistan, qatar, china and syrria was their opponents. Finally they concede two goals against syrria, which was not an inportant match for them because they were qualified for fifa world cup two mathes earlier!!! they have beaten INDIA which is in the game, 3-0 in delhi and 4-0 in tehran, 7-0 in aggregate. BUT IRAN NATIONAL TEAM, THE FIRST TEAM OF ASIA ACCORDING TO FIFA RANKINGS, ARE NOT IN THE FIFA, WHAT A SHAME FOR EA!!!!!!!!!!!!!!! Why fifa never put Iran while it is for 2 years the best of Asia and have been one of the best teams of Asia all time. Even qualifying for world Cup you don’t consider it. I think Iran is the only qualified country that you ignored as usual. Have you forgotten about Croatia?